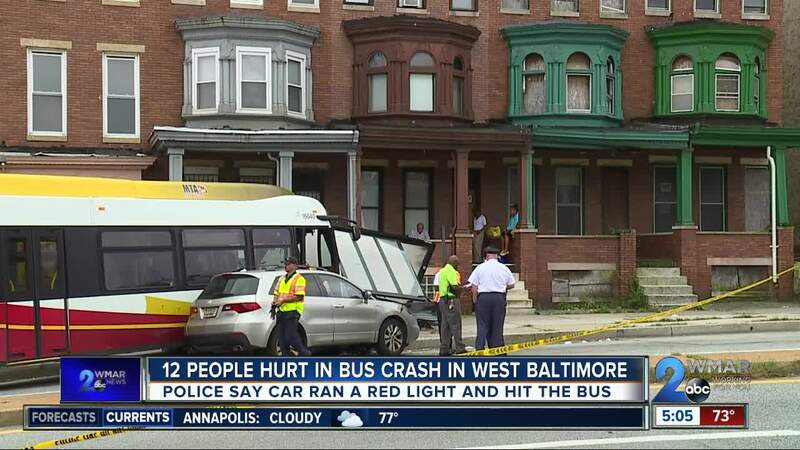 Baltimore Police are investigating a bus crash Friday afternoon where 12 people were injured. Police say the crash happened at W North Ave and N Bentalou and to expect traffic in the area. 12 people were injured in the crash and two are severely hurt. Officials say a car went through a red light and hit the MTA bus, causing it to go onto the sidewalk into a bus stop. The driver of the car and the bus driver are severely hurt and the other 10 injured were on the bus. Baltimore Police are investigating a bus crash Friday afternoon where 12 people were injured. Police say the crash happened at W North Ave and N Bentalou and to expect traffic in the area. 12 people were injured in the crash and two are severely hurt. Officials say a car went through a red light and hit the MTA bus, causing it to go onto the sidewalk into a bus stop. The driver of the car and the bus driver are severely hurt and the other 10 injured were on the bus.